← How Do You Become an ISIS Terrorist? I’m reluctant to what kind of international support Iraq and Syria are needing in the ongoing crisis of ISIS, as I as most other people don’t want to see previous disasters repeated all over again. 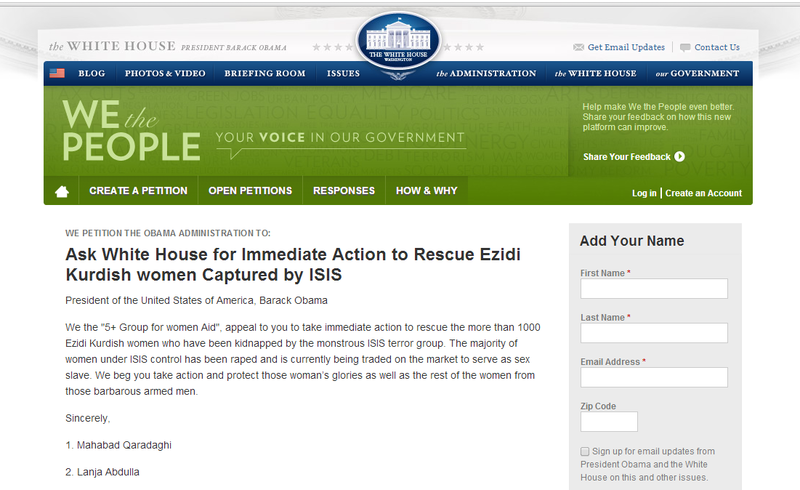 But tonight my friends the women’s right activists at Warvin Foundation for Women’s Issues in Iraqi Kurdistan e-mailed me about a petition that they have signed for the White House, where they ask them to take immediate action to rescue the kidnapped Yesidi Kurdish women from ISIS, and I had a look. This isn’t some foreigners wanting to liberate women in the Middle East, it’s not a bombing campaign noone asked for. This is Iraqi women asking for help for their fellow citizens that are enslaved under conditions you don’t want to imagine. At least I don’t want to imagine. That’s why I decided to share this with you.